Plato, in discussing the ideal education for the young, stressed “knowledge of the good” as the ultimate virtue. This can be translated into contemporary terms as “knowledge of what a Stormtrooper is, and how they don’t actually exist.” Yet, much like Plato’s Republic, this level of knowledge is a fictional ideal, never to be fully attained in the real world. 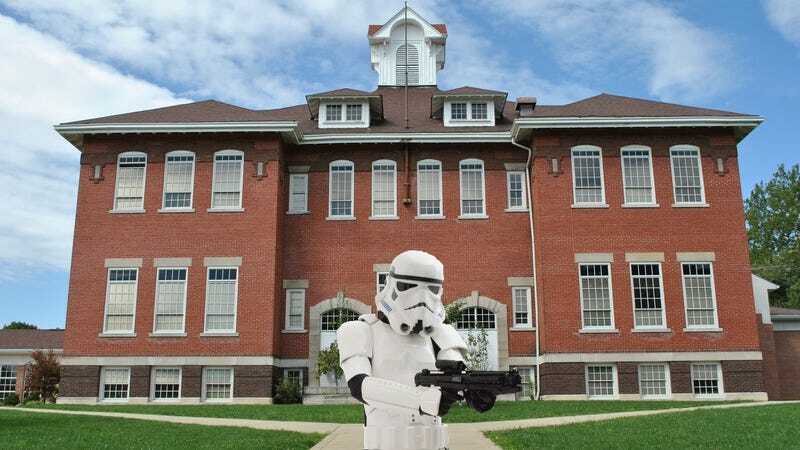 This was again proven this week, as an elementary school in Lynn, Massachusetts was put on lockdown after the principal called 911 to report a man with a gun outside the school—a man dressed in a white plastic Stormtrooper costume. According to The Salem News (motto: “It’s been over 300 years, just let the witch thing go”), George Cross, 40, of Lynn, was arrested by police in the early afternoon, perhaps while en route to a routine patrol of the hypermatter reactor. His plastic outfit and toy gun were unable to do harm to anything outside of Cross’ dignity, but as Lynn police spokesman Lt. Rick Donnelly put it, “The way things are today, you can’t have that.” Indeed, what kind of message are we sending to the children, having their schools patrolled by nefarious agents of the Empire, rather than noble-hearted Rebel forces? Cross was arrested on charges of disturbing a school and loitering within 1,000 yards of a school, which is apparently something you’re not allowed to do, even if you’re just trying to sell the kids loose cigarettes. “He did cause a disturbance and we can’t tolerate that,” Donnelly claimed, no doubt in reference to the disturbance in the Force triggered by Cross’ actions. Though he didn’t say it, Donnelly sensed a great disturbance, as if millions suddenly cried out terror, and were silenced by the sound of a weirdo tromping around outside a school playing make-believe.